The College will fund small groups of students and faculty members to dine together at restaurants throughout Harvard Square as part of a new effort to develop stronger relationships between students and professors. The new pilot program, dubbed “Classroom to Table," provides funding for students and faculty members to dine at one of several Harvard Square eateries: Grafton Street, Park Restaurant, Russell House Tavern, and Uno Pizzeria & Grill. The Office of Undergraduate Education will cover the cost of the meal up to $20 per person and independently receives a charge from restaurant management. "The opportunity is to help students and their professors engage outside of the classroom on topics that might come up in the class in which they encounter each other or might be related or might be quite different, but fosters the possibility of a further discussion in any number of directions," said Noel Bisson, the College's associate dean of undergraduate education. The program brings together a series of ideas proposed by several faculty members and students in recent months, Bisson said. Sharon Zhou ’15 presented one such proposal last May to Provost Alan M. Garber ’76 along with the support of Eliot House Master Douglas A. Melton. Zhou’s idea came from her own experience connecting faculty members in different departments, she said. “Freshman year, one of my Classics professors and one of my Linguistics professors both were really interested in Slavic languages, but they didn't know each other even though they were both in Boylston and only one floor apart. So I connected them at a tea event,” Zhou said. 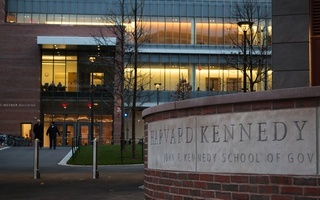 Although administrators at the Office of Undergraduate Education expect that students will begin using the program to engage with a singular professor, they will provide flexibility for other arrangements, according to a College-wide email about the program from Dean of Undergraduate Education Jay M. Harris. Faculty members might also host students across a variety of courses, or a group of students might bring together two different faculty members, as Zhou suggested. “We’re at Harvard, and we have all this knowledge everywhere, and if it’s all siloed, we’re not tapping into all of the interdisciplinary, creative, innovative ideas,” Zhou said. For now, administrators are publicizing the program as an experiment, and the Office of Undergraduate Education is still considering ways to measure its success, acknowledging the possibility of expansion. “We are testing it right now with the belief and some expectation that there will be real benefit to having this kind of conversation fostered between students and faculty. We can only imagine that it would be beneficial,” Bisson said.